The legendary Dr. S.P. Balasubramanyam lights the lamp at the finals in Atlanta. North American Telugu Association (NATA) sponsored Padutha Teeyaga finals in Atlanta, hosted by the legendary Dr. S.P. Balasubramanyam, on May 31 and June 1, 2014, at Independence High School in Alpharetta. The program, presented by People Media, is a singing competition with auditions in all major cities of the U.S.
Dr. S. P. Balasubramanyam (SPB to many of his ardent fans) is a phenomenon. His extraordinary singing capabilities, his ready wit and humor, his passion for perfection, and his down to earth simplicity laced with respect for all, endear him to everyone and magnify his stature a million times. Suma, the charming anchor from South India, was the guest for the show, which saw 19 contestants in the age group of 9-12 compete with grace and determination for the coveted 13 spots that would take them to the second round of this epic competition. NATA President Dr. Sanjeeva Reddy and NATA 2014 Convener Bala Indurti welcomed SPB to Atlanta and recorded their deep gratitude for being able to help conduct this fantastic event for kids. The Paadutha Theeyaga event wishes to raise awareness of the beauty of our Telugu culture and literature in a simple and telling way for the young contestants from across the USA. This noble concept resonates well with the vision of NATA leaders Dr, Prem Reddy and Dr. Malla Reddy, whose philanthropic efforts have already helped millions in India and across the world. NATA convener Bala Indurti informed the thrilled audience that Atlanta is “doubly lucky” this year, as it will proudly host Dr. SPB twice, the second time at the NATA biennial convention from July4th to 6th this year at the GWCC center in downtown Atlanta. Telugu-speaking people from all over the world will enjoy a convention that has everything to meet the needs and tastes of everyone! In a packed auditorium, the finals kept the audience glued to their seats across the weekend. 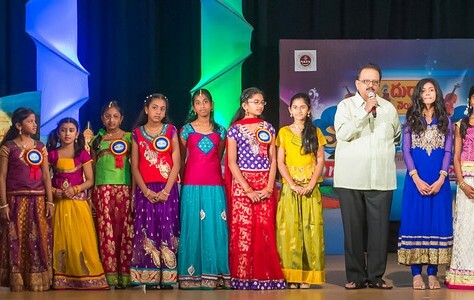 At the end of six rounds, 13 children moved on to the second round, but in the heart of SPB and all the people present, every child was a winner for rising to the challenge and attempting their best in front of such grand personalities like SPB and Suma. 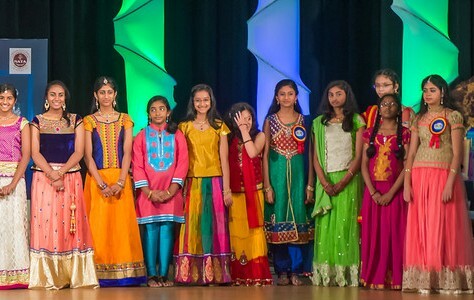 As the finals were held in Atlanta, it was a cause for joyous uproar to cheer the lone contestant from Georgia, Meghana Pothukuchi, who made it to the finals, along with the talented children from other states across the USA.